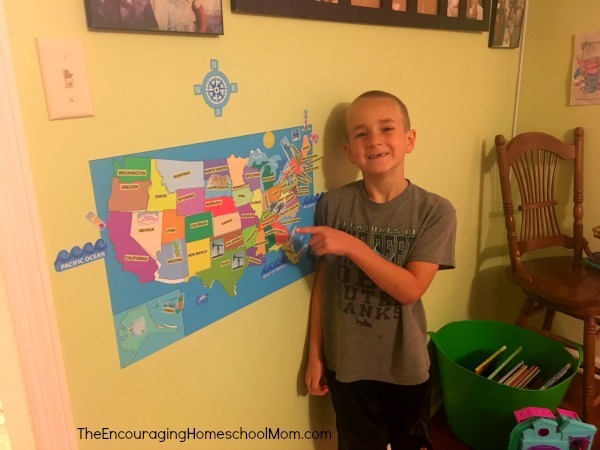 The Coolest Homeschool Walls: US Map in Action! 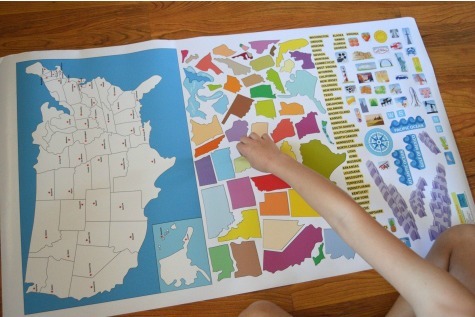 Educents has a perfect new resource by Mona MELisa Designs that will get kids out of their seats and loving Geography. 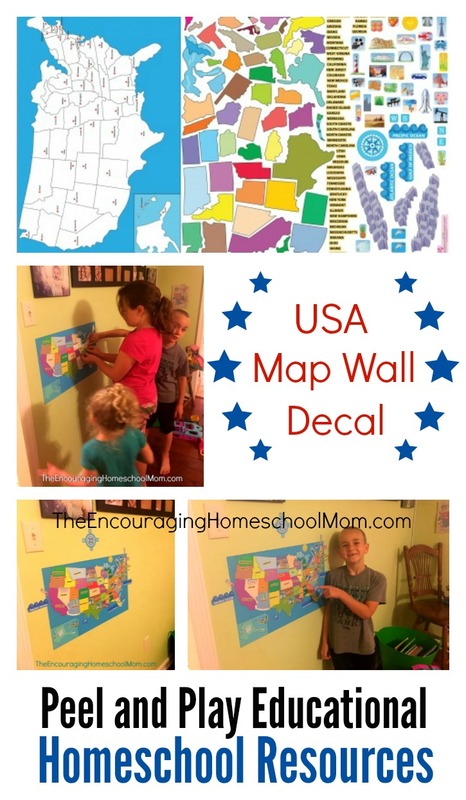 Interactive and fun, this American Map Wall Decal set would make a great addition to your homeschool social studies adventures. Produced by the same company that brought you the Human Body Wall Decals, this peel and play educational play set has all the reliability and quality that we’ve come to expect from Educents outstanding products. I talked in my post about the Human Body Play Set about how well these decals are made. They’re cleanable, reusable, and durable. They clean up easily using simple household ingredients like rubbing alcohol. They’re also tough and not easily ripped or torn. Which, as any mom knows, is a big deal when you have lots of little hands that all want a turn! The fact that they’re reusable and endlessly adhesive means you’re getting what you paid for. These aren’t stickers that are here today and gone tomorrow. They’re high-quality wall decals that can be packed up and used again next year. 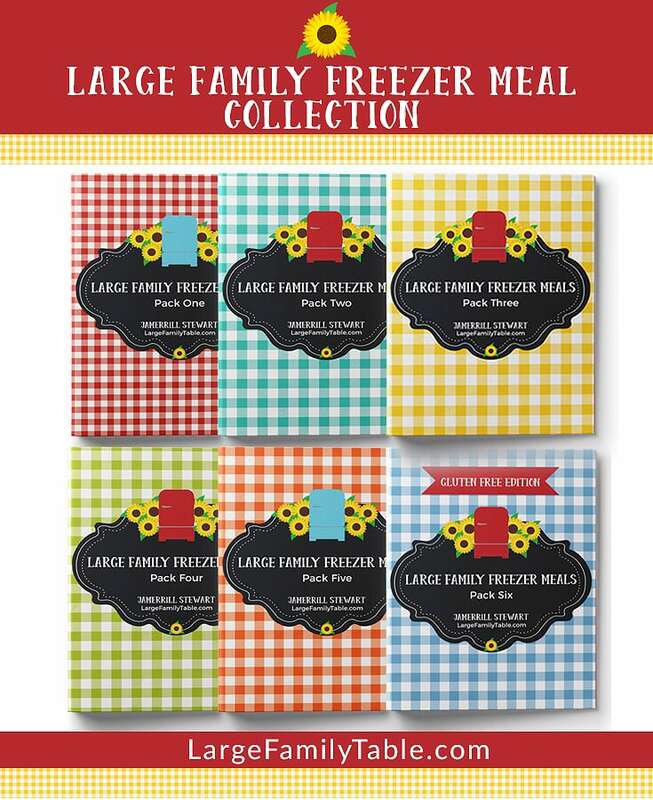 They’re also made from a quality fabric manufactured in the USA without BPA, lead or PVC so they’re safe for your family. Kids learn better when they can move around. Peel and play educational wall decals are ideal for kinesthetic and visual learners but sets can be combined with verbal instructions to meet the needs of auditory learners as well. It’s amazing how much kids can absorb when they’re having fun. There are a lot of great details in these geography decals for a range of educational benefits for multiple ages. Valued at $44.99, these educational decals are currrently on sale for $39.99. But don’t forget, Encouraging Homeschool Mom readers can take and additional 10% off Educents orders with special coupon code FHDeals10. 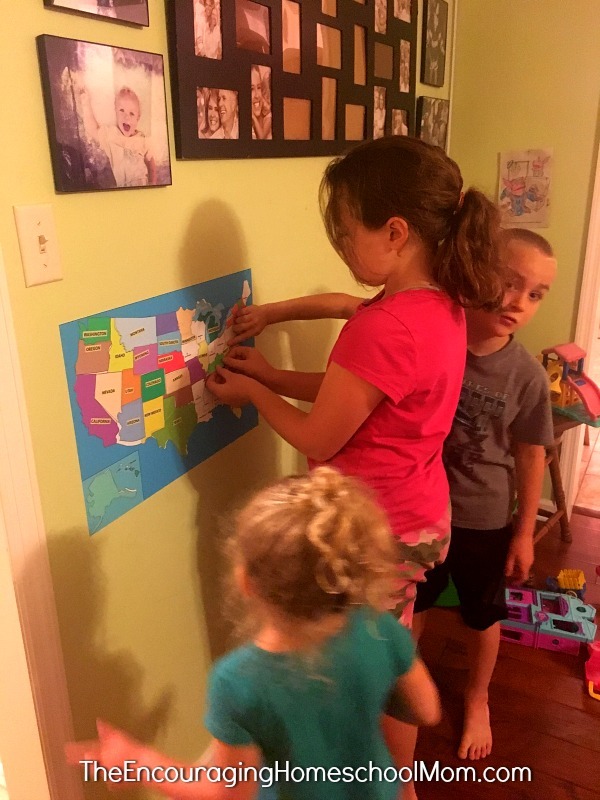 Check out the video below for more information and inspiration for how to use your USA Map Wall Play Set. You can also see my kiddos complete this entire in the original Coolest Homeschool Walls video!